Description: This is a large and stout bodied goby with adults reaching a maximum length of approximately 17cm. It is usually greyish-brown in colour with darker and paler mottling and patches. Despite its common name it is not as dark as breeding males of the rock goby (Gobius paganellus). Lines of black sensory papillae are visible on the head. The most distinctive characteristic is the elongate, first dorsal fin, this is most obvious in males. 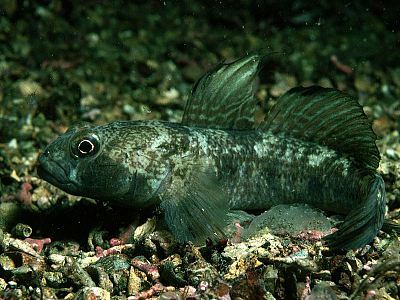 Habitat: The black goby lives in sandy or muddy areas or on rock that is covered by sediment. It can tolerate reduced salinity and so is also found in estuaries, lagoons and sea loughs. It mainly feeds on small crustaceans, small fish, molluscs and worms. Distribution: This species is widespread all around the coasts of Britain and Ireland. Similar Species: The black goby is sometimes confused with the rock goby (Gobius paganellus) however the latter is confined to rocky areas whilst the black goby lives in sandy or muddy areas. The two species can easily be differentiated by the shape of the first dorsal fin which is elongate and triangular in the black goby. Picton, B.E. & Morrow, C.C. (2016). Gobius niger (Linnaeus, 1758). [In] Encyclopedia of Marine Life of Britain and Ireland.